At the 2017 Ergo Expo, we were surprised to see that many companies hadn't noticed that the geometry of dual-link arms pushes the monitors substantially forward over the desktop and too close to the person if they are in a cubicle setting or facing a wall—which impacts most users. Our experience installing monitor arms in real-world situations indicated a better solution was needed. The Modula Multi Flex Mount is a metal extrusion/sliding rail that allows the user to mount monitor arms to a slider rail, not the desktop surface, so they can freely adjust their monitor horizontally. It helps accommodate wide screen monitors and users that share workspaces or work collaboratively on long desks. In contrast, our Avia uses the dual hub to spread the arms apart, though this is a fixed distance that is not always the ideal spread. Multi-flex Mounts, when added to our versatile Modula series arms, are a natural solution for effectively configuring heavy-duty monitors in call-center, trading and other high-demand applications—especially if your users require fast, on-the-fly horizontal adjustments over larger ranges. 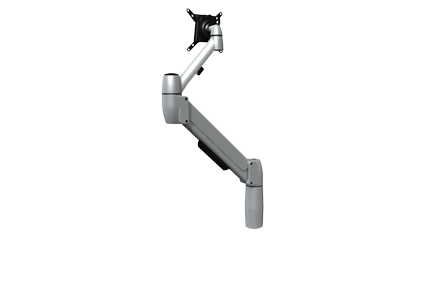 In terms of the monitor arms themselves, our Standard option offers a great range of monitor rotation, horizontal and vertical movement, tilt and more to give you the most freedom of movement for your users' application and work style. We also feature a Sit-stand desk option which offers a greater range of horizontal adjustment for adjustable-height desks. All arms can support from 5 to 30 pounds per monitor and are available in your choice of today's hottest colors for the office, and the neutral-color Mount looks great with any of them. All come standard with Quick Change monitor mounts which allow you to quickly swap out, repair or maintain your monitors. Multi-Flex mounted monitor arms, while they share the same general specifications and features as our standard Modula line, require special mounting hardware to securely attach to the Multi-Flex rail and should be ordered at the same time to ensure compatibility. Please call us with any questions. Additional rail lengths are available via special order. Call us for details. 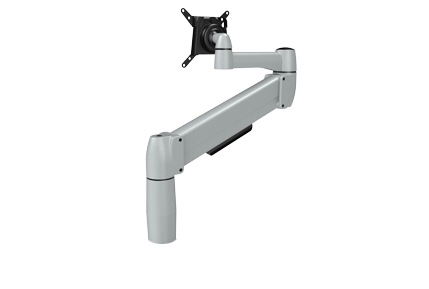 Additional Monitor Arm solutions for Multi-Flex configurations are available via special order. Please call us for details. Multi-flex rail is available exclusively in Platinum. Security and stop features are available by special order. Please call us for details.